Scuba divers have long been drawn to the Florida Keys. Now these crystal blue waters are luring nondivers, too, thanks to snuba  a hybrid of snorkeling and scuba diving. The system supplies air from a raft on the surface, with divers connected to a hose that stretches to a depth of 7 m. Unlike scuba diving, no certification is necessary  just a short orientation. "We've been taking out about a thousand people a year," says Joe Hall, who operates a snuba-dive outfit on Duck Key. "Many of them come back the next time wanting to learn to scuba dive." Instructors show novices how to breathe into the regulator attached to the air hose and how to equalize ear pressure. With a guide in tow, participants then plunge into the water for a 45-minute swim, surrounded by spectacularly colorful fish and gliding over a seafloor littered with starfish and coral. 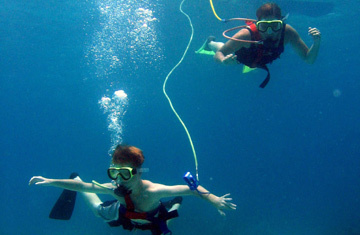 Dive Duck Key offers daily snuba trips to around 30 sites for ages 8 and older. For details, see diveduckkey.com. See reviews of 50 American wines.